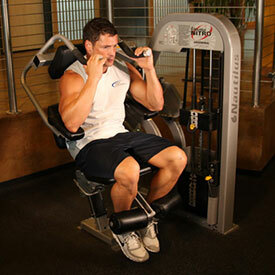 Sit on a low pulley row machine with a rope attachment. 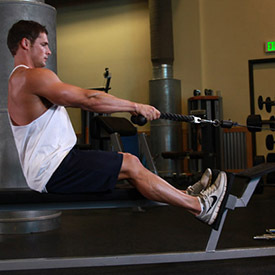 Grab the ends of the rope using a palms-down grip and sit with your back straight and your knees slightly bent. 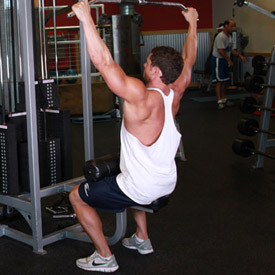 Tip: Keep your back almost completely vertical and your arms fully extended in front of you. This will be your starting position. While keeping your torso stationary, lift your elbows and start bending them as you pull the rope towards your neck while exhaling. 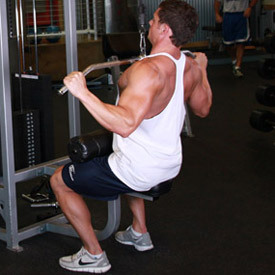 Throughout the movement your upper arms should remain parallel to the floor. Tip: Continue this motion until your hands are almost next to your ears (the forearms will not be parallel to the floor at the end of the movement as they will be angled a bit upwards) and your elbows are out away from your sides. After holding for a second or so at the contracted position, come back slowly to the starting position as you inhale. Tip: Again, during no part of the movement should the torso move. 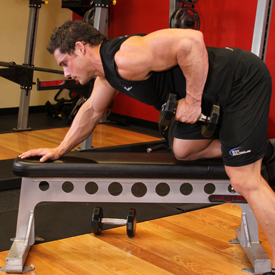 Variation: You can use a straight bar attachment as well or a bench and exercise bands. While keeping the arms straight, go back to the starting position while breathing in. 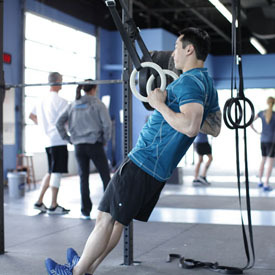 Variations: Can also be performed with a shorter shoulder-width straight bar or with a rope attachment. Pull the resistance straight up to the side of your chest, keeping your upper arm close to your side and keeping the torso stationary. Breathe out as you perform this step. 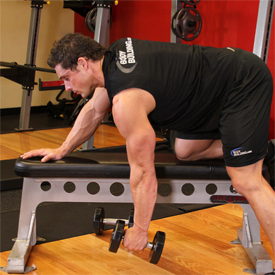 Tip: Concentrate on squeezing the back muscles once you reach the full contracted position. Also, make sure that the force is performed with the back muscles and not the arms. Finally, the upper torso should remain stationary and only the arms should move. The forearms should do no other work except for holding the dumbbell; therefore do not try to pull the dumbbell up using the forearms. 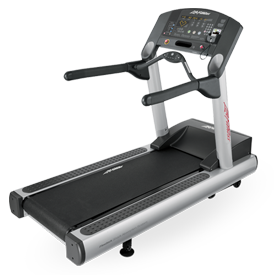 Repeat the movement for the specified amount of repetitions. 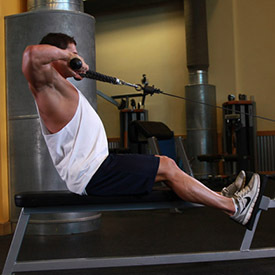 Variations: One-arm rows can also be performed using a high pulley or a low pulley instead of a dumbbell. 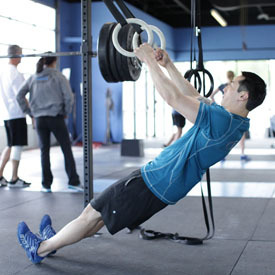 Suspend your straps at around chest height. Take a handle in each hand and lean back. Keep your body erect and your head and chest up. Your arms should be fully extended. This will be your starting position. Begin by flexing the elbow to initiate the movement. Protract your shoulder blades as you do so. At the completion of the motion pause, and then return to the starting position. Lie on the floor with the knees bent and the feet on the floor around 18-24 inches apart. Your arms should be extended by your side. This will be your starting position. Crunch over your torso forward and up about 3-4 inches to the right side and touch your right heel as you hold the contraction for a second. Exhale while performing this movement. Now go back slowly to the starting position as you inhale. Now crunch over your torso forward and up around 3-4 inches to the left side and touch your left heel as you hold the contraction for a second. Exhale while performing this movement and then go back to the starting position as you inhale. Now that both heels have been touched, that is considered 1 repetition. Continue alternating sides in this manner until all prescribed repetitions are done.